Hubble Sees A Galaxy 13.4 Billion Years In The Past, Breaking Distance Record : The Two-Way Looking from Earth, it's in an area just above where the handle of the Big Dipper meets its cup — or, if you prefer, it's just above Ursa Major's rump. A NASA video shows a long zoom-in to the view of a galaxy 13.4 billion years in the past, in what the agency says is a new cosmic distance record. Think of it as a galactic baby photo: a red blotch representing what a galaxy looked like just 400 million years after the Big Bang. NASA says the "surprisingly bright infant galaxy" known as GN-z11 is the farthest galaxy ever seen from Earth, at 13.4 billion years in the past. "We've taken a major step back in time, beyond what we'd ever expected to be able to do with Hubble," says principal investigator Pascal Oesch of Yale University. "We see GN-z11 at a time when the universe was only 3 percent of its current age." In what should qualify as the longest zoom-in ever represented in video, NASA released a video showing the portion of the Earth's night sky where the galaxy was spotted by the Hubble Space Telescope. The galaxy is in an area just above where the handle of the Big Dipper meets its cup — or, if you prefer, it's just above Ursa Major's rump. The achievement puts astronomers another step closer to the galaxies that first formed in the earliest years after the Big Bang. 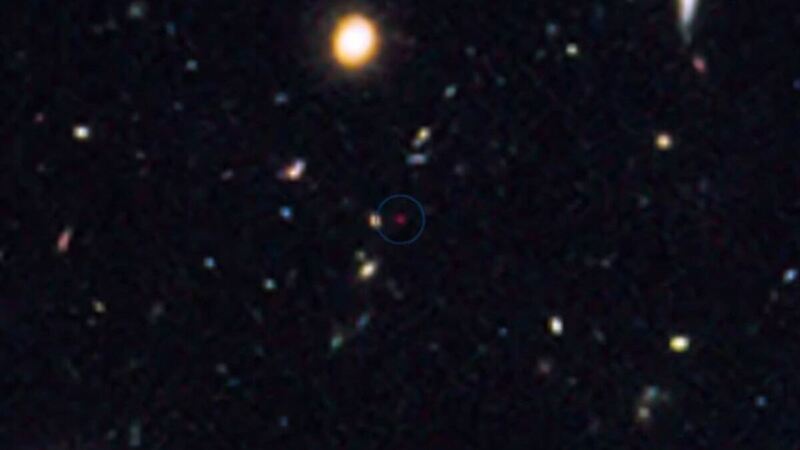 Before now, the farthest observed galaxy was 13.2 billion years in the past. As for what GN-z11 looks like, it's "25 times smaller than the Milky Way and has just one percent of our galaxy's mass in stars," NASA says, adding that the galaxy's prolific formation of stars accounts for its visibility. "Astronomers measure large distances by determining the 'redshift' of a galaxy. This phenomenon is a result of the expansion of the universe; every distant object in the universe appears to be receding from us because its light is stretched to longer, redder wavelengths as it travels through expanding space to reach our telescopes. The greater the redshift, the farther the galaxy."